All you loyal Candy Addict readers know of my undying love of Annabelle’s candy, my favorite being Big Hunk, but I do enjoy all their offerings when I can find them. These new Supreme bars are a good twist on the classic Rocky Road, with a slab of marshmallow studded with nuts (the original uses cashews) and then covered in chocolate. These two new flavors are Peanut Butter and Mocha, both of which are incorporated into the Rocky Road format. Mocha: The Mocha Supreme is covered in dark chocolate and infused with coffee flavors, yet I only smell a little of the coffee when I open the package. Breaking off a piece, I noticed that this is a double decker marshmallow, separated with a small layer of chocolate in between. It was hard to tell which layer held the mocha flavor, but I do believe it was the top. The flavor is very sweet, with a mild mocha flavor which makes the bar very balanced and not overpowering, which some coffee flavored candy can easily be. The marshmallow is fresh and fluffy so the overall texture is very soft. This makes the Mocha Supreme a little hard to eat, but the taste makes up for that inconvenience. Peanut Butter: This Supreme bar is milk chocolate coated and immediately smells of salty peanut butter when the package is opened. Looking at the cross section, there’s a very thick stripe of peanut butter sitting on top of the marshmallow. The flavor is so nice. 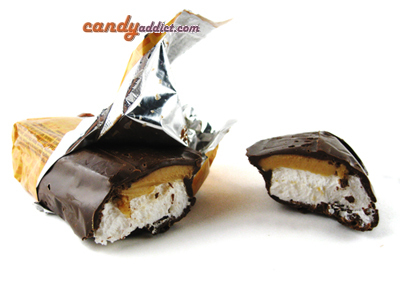 Right away you get the light sweetness of the marshmallow and then a good powerful kick from the salty peanut butter. It’s great! 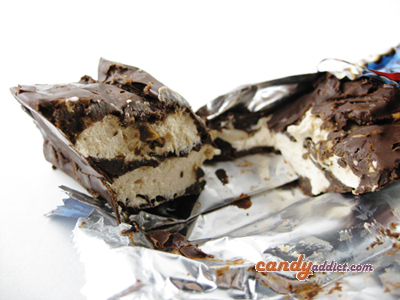 The chocolate doesn’t deliver much to the overall taste, but instead lends a smooth texture. This Supreme bar has a really great combination of flavors that are satisfying without being too bold. Again, my only complaint is that it’s a bit messy to eat and the chocolate felt a tad greasy. I’m glad Annabelle’s finally came out with these tasty bars and they’re certainly worth trying, especially if you’re a Rocky Road and/or a fan of marshmallow. 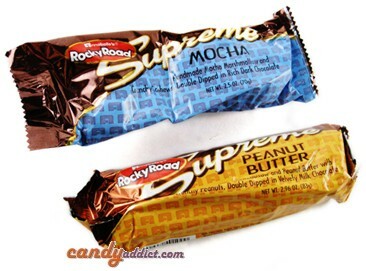 I find the makeup of the Rocky Road and these new Supreme bars both unique and satisfying. My only word of caution is that these bars are big – almost 3 oz each – so be sure to have a friend on hand to share them with. The mocha bars are incredible! I’m not a big fan if marshmallow and I think they are absolutely wonderful! OMG — THE PEANUT BUTTER SUPREME IS TH8E BEST THING I HAVE EVER EVER EVER TASTED. THEY HAVE BEEN OUT FOR A WEEK, AND I AM ALREADY AN ADDICT….LET ME KNOW WHEN THE SUPPORT GROUP STARTS! THEY ARE SUPERDELIOUSOHMYGAWDIMINHEAVEN GOOD! !